Maria Petrova from Bulgaria. This could be one of the most famous starting positions in Rhythmic Gymnastics history and one of Maria’s most original routines. Katrin Taseva (BUL) starts and ends her 2018 ball routine with this curious position. Viktoriya Mazur (UKR) started this lovely ball routine with the ball between her foot. Alina Kabaeva (RUS), who introduced contortion elements to rhythmic gymnastics at the end of 90’s. Anna Rizatdinova (UKR) began 2013 season with this suggestive ball starting position. Elizabeth Paysieva (BUL) starting her rope routine showing her back flexibility skills. Anna Bessonova (UKR) started her dramatic “Avrora” hoop routine holding the hoop between her wrists. Viktoria Shynkarenko (UKR) deep look to judges. Silviya Miteva (BUL) holding the ball on her arms. Tamara Yerofeeva (UKR) starting with a balance that continued with a tourlent. Dubai Youth Olympic School of Rhythmic Gymnastics organizes a summer camp training in Dubai from July 1st to August 31st. The camp consist of Rhythmic gymnastics master classes, ballet and dance. It also includes individual training with world class coaches and choreography of FIG routines (The Fédération Internationale de Gymnastique). Kseniya Dzhalaganiya is a former European and World Champion Rhythmic Gymnast, who founded Dubai Gymnastics Federation. Oksana Skaldina was her coach. One of her main goals is becoming European Junior Champion in 1998 and World Champion in groups in 2002. Just in the middle of this season, Sofiya Skomorokh got injured. A few days after, the whole Russian National Group flew to Israel, where the new composition of the group was decided. The members of the group after this camp were: Anastasiya Maksimova, Maria Tolkacheva, Anastasiya Bliznyuk, Anastasiya Tatareva and Kseniya Polyakova. Kseniya made her debut in Russian National Championships last weekend. Head member of the group, Anastasiya Maksimova said that Kseniya was “a good choice”. On the other hand, Russian Group is not traveling to Rio Test Event that is going to be held this weekend. Irina Viner-Usmanova said that Group is not traveling because “traveling 18 hours to Rio for just a weekend is non-sense”. Irina Viner-Usmanova also spoke about Sofiya’s injury. Yuliya Atrushkevich is one of the international judges of Ukraine. Yuliya lives in Odessa, but is often in Kiev helping Irina Deryugina. – In your opinion, who is the most promising individual gymnast in Ukraine? – Looking forward the future, I would say our top gymnasts could be Mariya Mulik and Alëna Dyachenko. –How could you describe Ukrainian leotards? – Irina Ivanovna (Deryugina) thinks that leotards must be simple, a extravagant leotard distracts. For me, Rizatdinova’s ones are the most beautiful because they have their own style. In my opinion, nowadays leotards are “too much”: different fabrics, glitter, velvet, mesh, sequins… We even have seen this year again, back to 90’s, leotards without skirt (Margarita Mamun, Varvara Filiou). – What is your opinion about Ukrainian gymnasts choreographies? – At this moment, my favorite exercise without any doubt is Carmen, performed by Anna Rizatdinova. I would also choose groups exercises and Rizatdinova’s clubs. We will add some new tricks to fill and complete the exercise, but overall, they are very good. Irina Blohina, our choreographer, helps us with dance steps, transitions and music choice’s. Of course we won’t change our choreographer because that means changing the whole team which is ridiculous. – Who is your favorite gymnast? – I would say Irina Deryugina, Oksana Skaldina, Aleksandra Timoshenko and Galina Beloglazova. Nowadays, I could not choose between Yana Kudryavtseva or Margarita Mamun. Both are lovely and smiley and i like their relationship with their coaches. Rita and Amina Zaripova seems like two soul in one. – In addition to Ukrainian team, which gymnasts do you like? – Salome Pazhava from Georgia, who has really difficult routines, Mariya Mateva from Bulgaria, Varvara Filiou from Greece and Patricia Bezzoubenko from Canada. But of course, my favorite is my whole team! Maria Titova was born in Penza Oblast’, Russia seventeen years ago. Since 2011, “Masha”, won several international tournaments as a junior gymnast such as Deriugina Cup 2012 where she won gold medal with the team. 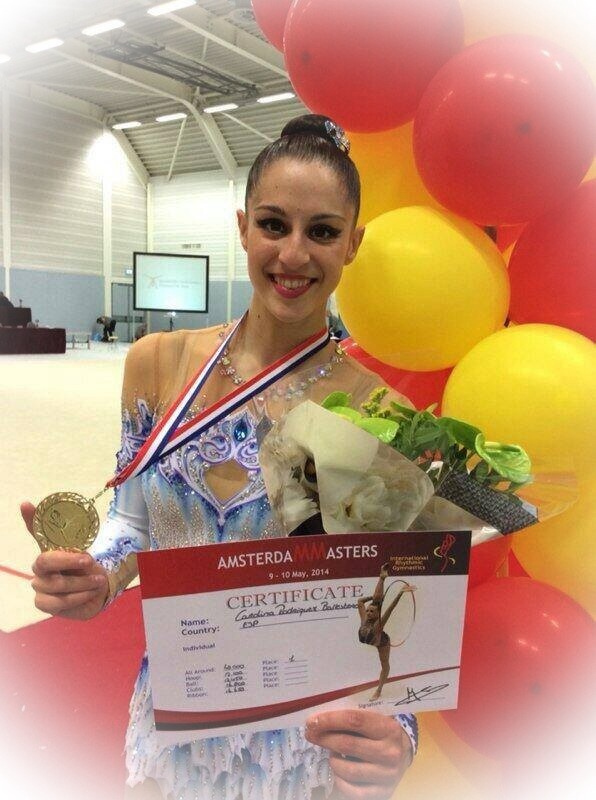 Irina Viner included Maria in Senior National team with Yana Kudryavtseva, Margarita Mamun and Darya Svatkovskaya. Dinara Gimatova, former Olympic gymnasts who represented both Russia and Azerbaijan, was her first coach in Novogorsk. In 2013 Maria got 5th position in Russian Championships. European Team Champion, Daria Svatkovskaya got injured so that Maria became number 3 of team Russia. Irina Chaschina (Masha’s favorite gymnast) and Evgeniya Kanaeva coach, Vera Shtelbaums, is right now working with Titova. Maria attended to almost every top competitions of the year: Grand Prix Moscow, Grand Prix Thiais, World Cup Stuttgart or Grand Prix Holon. Her next competition will be in Kazan (World Cup) just before World Championships in Izmir.